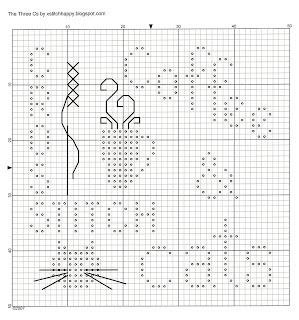 I've charted the cat, cup and needle in case you can't find buttons or charms for them. Thank you SO much ! Among my absolute favorites: coffee, cross stitch & cats. Am enjoying all your designs very much. Thank you so much for all of your free designs. They're great!! goodness, so cute!!! Luv it. Very cute, thanks for posting it!! Very cute, thank you for sharing it!! chnage that coffee to chocolate you've hit all my favourite things on the head! Funny you should mention that, I thought of chocolate also after the chart was done - I may have to make another version! Ciao. Ho preso questo schema e l'ho adoperato per creare una tovaglietta assieme ad altri due disegni, ne è venuto qualcosa di bellissimo... e ci tenevo a ringraziarti per averlo reso disponibile. Your patterns are adorable! 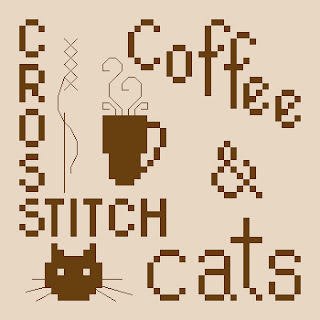 I especially liked this one, as cats, stitches and coffee are definitely among my favorite things in life! Thanks a bunch for all those lovely freebies!